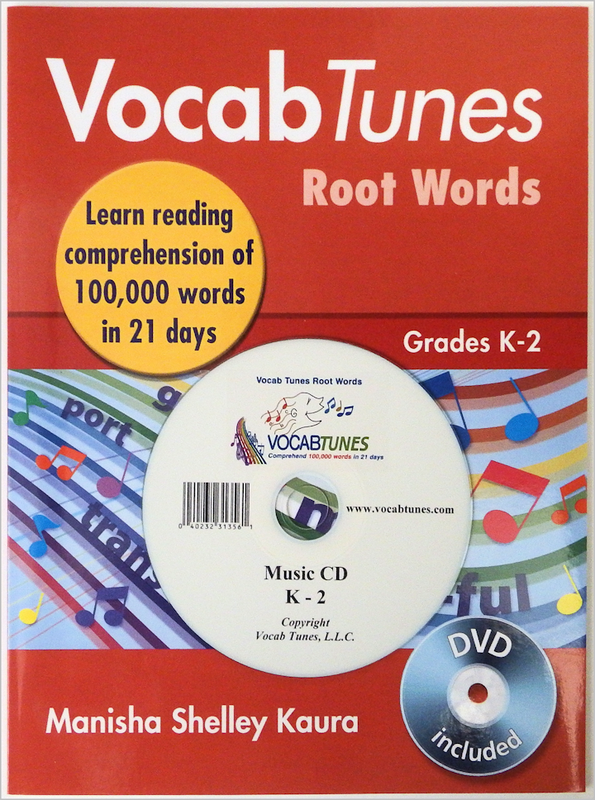 Vocab Tunes’ Root Words K-2 grade W/CD reading program is a unique accelerated learning program for preschool to 8th grade school children. This distinctive learning program, the only one of its kind, consists of interactive workbooks, CDs, and DVDs. With our exceptionally designed products, children get the opportunity to learn 100,000 words in just 21 days while grooving on its 21 fun music videos. Research shows that budding minds are excellent at understanding patterns. This reading program comprising prefix, suffix, and root words derived from Latin and Greek roots, will help your children understand the pattern of English vocab words to discover infinite new words. By understanding the parts that words are made from, your child will be able to understand over 60% of English, up to 90% of science terminology and 71% of social studies terminology. For example, the Latin root ‘mot’ meaning ‘move’, gives birth to many English words such as motorcar (car that ‘moves’), motorist (one who ‘moves’ car), and motion (the condition of ‘moving’), all of which can be seen as a pattern and stored under root word ‘mot’. As words are added, your child’s young brain will have developed the mental organization skills to easily read, remember and figure out new words. All of our product transactions are handled by Amazon for your safety and convenience!